Boss Jimmy Floyd Hasselbaink says ‘exciting’ new signing Shay Facey will give the Cobblers ‘flexibility’, and allow him to alter the team’s system. The 22-year-old defender put pen to paper on an 18-month deal at Sixfields, after leaving Premier League giants Manchester City and signing for Town for an undisclosed fee. Facey spent 10 years at the Etihad Stadium, rising through the academy and youth levels, but failed to make a first team appearance for the Citizens. Primarily a right-back, but he can also play central defence, Facey has enjoyed loan spells with New York City in the MLS, Heerenveen in the Dutch Eridivisie and Rotherham United in the Sky Bet Championship. 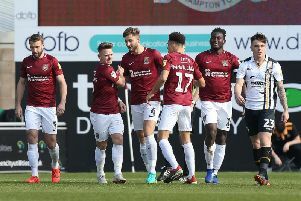 He has been training with the Cobblers since early December, and Hasselbaink is delighted to have landed his signature. “Shay is a very exciting talent,” said the Cobblers boss. “He has a lot of pace and is aggressive, they are very welcome attributes, and he will give us flexibility in terms of the systems we can play and the options open to us. With Aaron Phillips out long-term with a thigh injury, there has been little cover or competition at right-back for Brendan Moloney, but Facey’s signing will rectify that. The Stockport-born player is available for selection for Saturday’s Sky Bet League One date with Southend United, subject to Premier League clearance.